… I was … well … I think this is what happened. 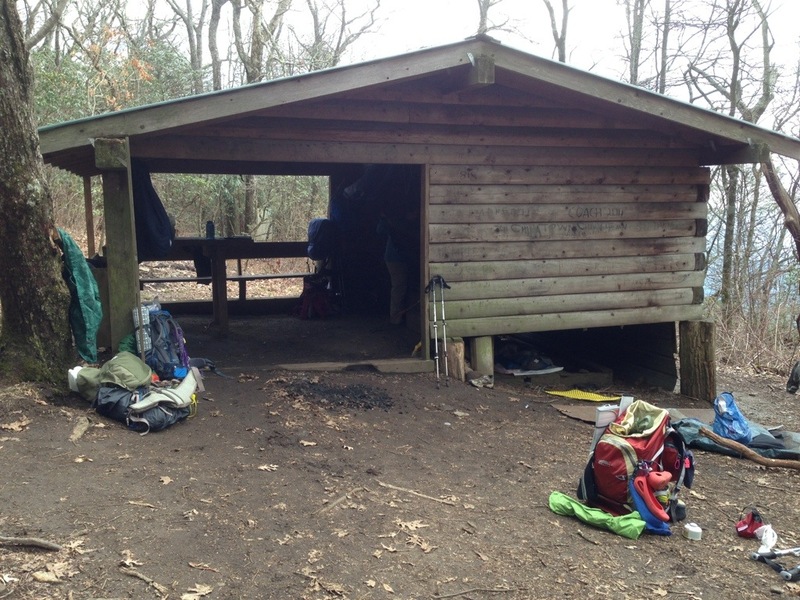 At Carter Gap Shelter, the shelter was full but there was a lower half finished level with a 4′ wide wooden platform do I opted to sleep under the shelter. It looked flat and level. really. It did! I set up my sleeping stuff and made dinner along with the really terrific bunch of folks there. We had a sweet little bonfire before we all hit the sack around 8. Now I’d heard stories of shelter mice running across people’s faces in the middle of the night but I was smart and pulled my buff all the way up over my face for protection. This had the added benefit offering my face warm. 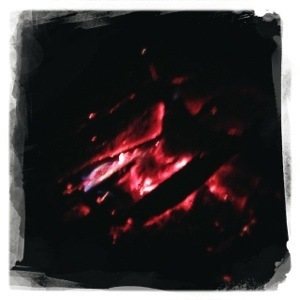 That night, it got really really cold. Suddenly … Something happened! Slip! Slide! CRASH! What? What? I’d gotten myself all the way down yo the bottom of my bag …. and the bag was upside down with the hood in front … and my arms were pretty much pinned to my sides in the mummy bag … and and and…. trying to get arms up over my head to unzip the upside down bag … zipper stuck … can’t see a thing … dark in a sleeping bag under a shelter at night with something over my should face. TRYING to do all this without waking up the people sleeping over my head! I managed to free myself, crawling through dusty dirt … trying to not crawl over the piece of metal corrugated roofing that I’d rolled into. My headlamp was not nearby but by light of my phone, I managed to reassemble my bed on the supposedly level platform and crawl in once more. As I drifted off, my bladder decided to wake up. This entry was posted in Uncategorized on April 4, 2013 by justbunny. OMG what a hilarious disaster aversion! I love your vivid writing, Bunny! People always ask me	“what’s that around your neck?” Your story reminds me why I always wear my headlamp	, even in town off the trail! I USE it every day at unusual times! Walk on! OMG funny! Last night, Chris and I were talking about your adventures after I’d read your Easter blog to her. She wondered if you slept in the notoriously mouse-infested shelters, and I said I didn’t know (having not read this post yet). Now we know! Glad to see I’m not the only one who wrestles with her sleeping bag at night. Oh, and yeah, what’s with that bladder waiting until the moment you just get comfortable again? Thanks for the laugh.